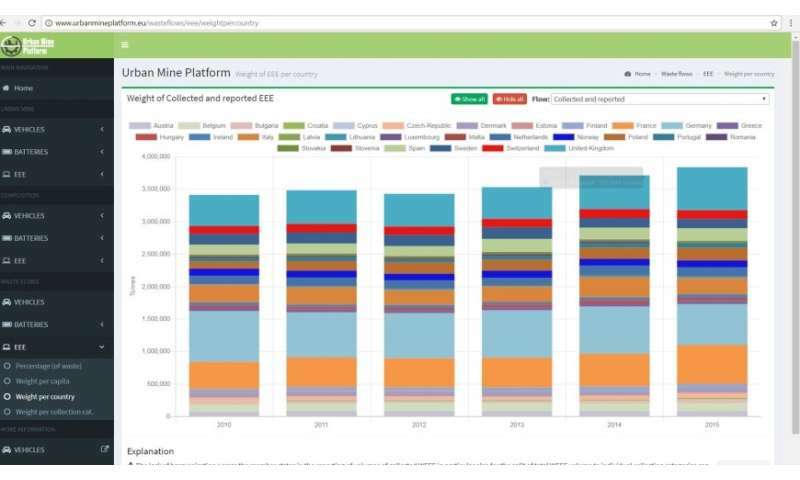 In January 2018 the first pan-European database for secondary raw materials, including many "critical" ones, went online. Ever since, we have known more about which raw material depots reside in cars, batteries and electronic devices sold, used and stored in the 28 EU countries – and ultimately recycled or disposed of. Empa played a key role in the ProSUM project. Every European owns an average of 250 kilograms of electrical and electronic devices. These are joined by 15 kilograms of lead batteries and two kilograms of other kinds of batteries, including 500 grams of lithium ion batteries, and a 60-kilogram share of a car. All these goods eventually break down or become obsolete. Some of them are thrown away and recycled, others are resold on platforms like ebay and ricardo. However, considerable quantities end up in drawers, cupboards and garages, where they form "raw material depots". Data on the presence and distribution of critical raw materials in Data on the presence and distribution of critical raw materials in products, components and waste has been generated from various quarters in recent years, such as research institutions, industry, public authorities and non-government organizations, and stored in various databases, formats and reports. As yet, however, nobody has collated and processed this data so that the recycling industry, authorities and political decision-makers can factor all these raw materials into economically and ecologically sensible strategies. This is precisely the challenge that the project "Prospecting Secondary Raw Materials in the Urban Mine and Mining Waste" (ProSUM), funded by the EU research program Horizon 2020, set itself (www.prosumproject.eu). Besides 17 research facilities from 12 countries, the project also involved three Empa laboratories, especially the Technology and Society lab, which was in charge of the work package "Product Characterization". Headed by Patrick Wäger, the lab has been investigating recycling systems for many years. 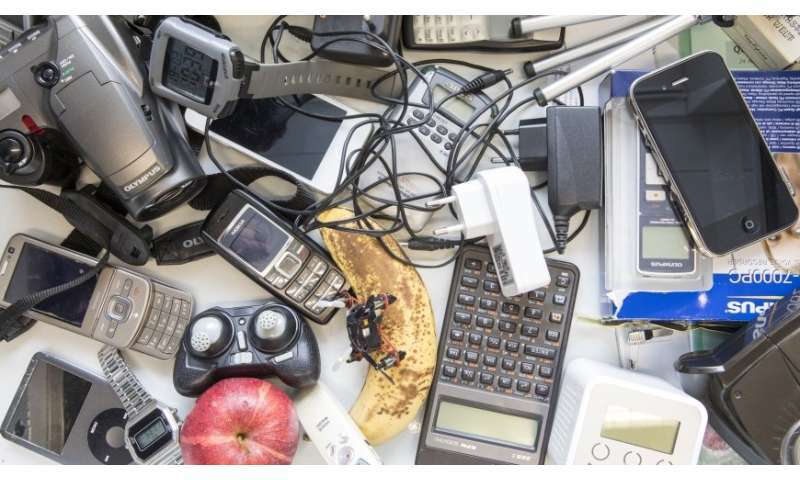 One of the research focuses is handling electrical and electronic waste (known as e-waste) in Switzerland as well as in developing and threshold countries. In recent years, the focus of the activities has widened to include critical raw materials such as indium, rare earth elements and platinum metals. Empa researcher Heinz Böni and his team have been concentrating on the role of critical raw materials in the "social metabolism". A play on the physical metabolism, this is what environmental scientists call the material and energy flows triggered by social activities. Research on social metabolism is a rather young science, with Peter Baccini and Paul Brunner paving the way in the late 1980s at Eawag, the ETH Domain's aquatic research institute. Since 2007 a research group at Yale University has been focusing on assessing raw material supply risks; the Yale researchers developed a "criticality matrix", based on which the EU published its first study on the criticality of raw materials in 2010. Böni's team especially focuses on closing material cycles for rare metals and critical raw materials. In a project funded by the Swiss Federal Office for the Environment, for instance, the researchers examined the recovery of neodymium, which is found in voice coil magnets in hard drives, for example, and recycling indium, which is found in flat screens. Currently, the Empa team is working on possibilities of recovering rare metals from electrical and electronic vehicle components and thus keeping them in the material cycle. It was researchers from Delft University of Technology who eventually approached the Empa scientists and asked them to join the ProSUM consortium. "The Dutch colleagues knew us from collaborations on other projects," says Patrick Wäger, who headed one of the five ProSUM work packages. The starting point was a database for mineral raw materials in the EU, which the French Office of Geological and Mining Resources (BRGM) had developed within the framework of an earlier EU project, "Minerals4EU". Empa researcher Amund Loevik was tasked with collating the scattered data from different sources and putting it in a consistent form. The primary goal was to assess the quality of the data and weight it accordingly. To accomplish this ambitious task, Wäger and Co called for backup from other Empa colleagues: Matthias Rösslein from the Particles-Biology Interactions lab helped Loevik with processing and evaluating the data using statistical methods. Analytics experts Renato Figi and his team from the Advanced Analytical Technologies lab developed and validated new methods to take and prepare samples and conduct chemical analyses (see page 16). The key objective here was to determine the level of critical raw materials contained in selected products and fractions from processing old batteries, electrical and electronic devices and in diverse shredder fractions from end-of-life vehicles. In January 2018 the ProSUM database finally went live on www.urbanmineplatform.eu. The Urban Mine Plat-form contains datasets on flows, stocks, composition and waste flows from batteries, electrical and electronic de-vices and vehicles. This enables researchers, the recycling industry and political decision-makers to obtain specific information on past and future developments, such as with a view to estimating the raw material potential of particular stocks in the urban mine or developing innovative recycling strategies.